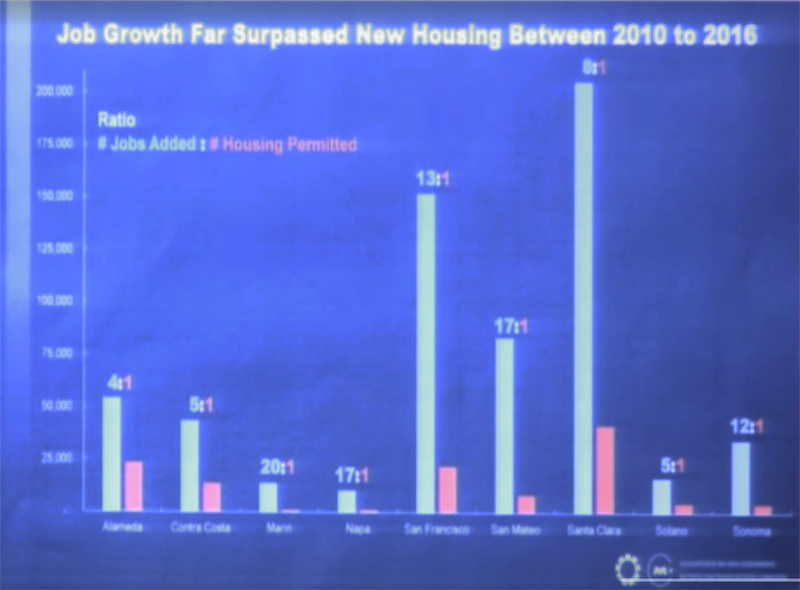 At the January 15th BOS meeting devoted to the Napa Strategic Plan, Supervisor Dillon presented a graph that she had asked staff to prepare to show the imbalance of job and housing creation that is the root of the traffic and housing problems in the Bay Area. The Napa ratio 17:1 is only eclipsed by Marin at 20:1. Although she didn't propose what the County should do to address the imbalance, and her purpose might be just to show that the imbalance is a problem everywhere (or that Napa's problem is comparatively small in absolute numbers), I had the uneasy feeling that she might be making the case that housing needs to be ramped up to meet the demand. One of the main takeaways from the Strategic Plan questionnaire and from the comments of other Supervisors is the need to increase housing construction ("remove barriers to maximize housing opportunities." in the words of Strategic Plan action item 10. ), a concept anathema to the original ag preserve zoning, and that both the wine industry and the Supervisors have heretofore seen as the greatest danger to an agricultural economy. As was discussed elsewhere on this site, some might have the opposite response to this imbalance: reduce the jobs numbers, or at least put a moratorium on job creation until the housing units already in the pipeline (some 4000 of them) begin to make a dent on the imbalance. With the number of jobs increasing at the current rate, no amount of home building will catch up and the entire county will eventually become a bedroom community trying to accommodate the demand, just as the rest of the Bay Area has. Sup. Dillon recognizes that it's the municipalities that are creating the bulk of the new jobs in the county and it's up to the County to work with them and encourage them to deal with the problem. But the county has a unilateral responsibility as well. The Mountain Peak Winery project next to me will add 19 new (mostly hospitality) employees for a vanity project in the remote hillsides. Building the project will bring an additional few dozen workers for a couple of years to the county. (Construction, as befits the change from a rural to urban county, is Napa's fastest-growing job creator with hospitality next). Each of the projects being approved every month at the planning commission is adding ever more employees to the top of the white bar in the graph. The number of homes being built will be pitifully small by comparison, and the imbalance and commuter traffic will only increase. The County has the discretion to stop building ever more projects that bring ever more employees needing housing and related development that will only create more pressure to turn its agricultural lands to more profitable use. They should exercise it.